I have barely updated this blog since the summer because I’ve been both very busy and rarely home. I spent most of September in Australia (a last minute trip off the back of bargain basement flights), with stop-offs in Singapore and the Emirates, visited friends in Nottingham almost as soon as I’d come back and recovered from jetlag, stepped up gig promoting in Margate and am in the midst of arranging to move house (while also trying to make sure I meet all my deadlines in the day job). I took a lot of photos in Australia, and also some field recordings of city and wildlife sounds that I plan to use in animation, but I haven’t had time or energy to organise or post-process them. Right now I’m working on a new website for the gigs I put on locally, and that takes priority. My work computer also died, luckily when I actually had the money to replace it. It feels luxurious to go back to a desktop Mac after five years of having so many cables going into a Macbook. On moving my files across I also discovered a load of folders of forgotten photos which are still worth editing. I also replaced my ailing scanner, so can once again scan film. I have a whole folder full of unscanned negs, and a fair few undeveloped films in my fridge, so expect a lot of photos in the next few months. 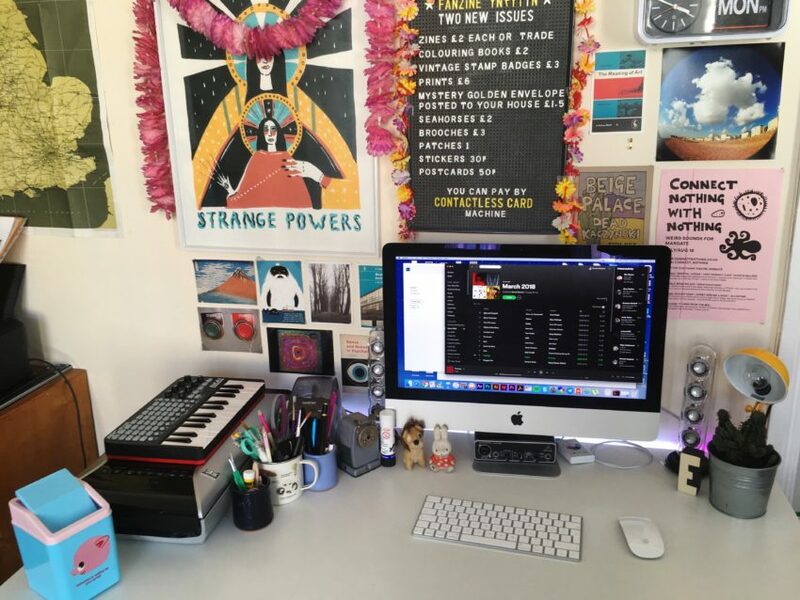 My workspace may look clean, because I can’t concentrate with a messy or dirty desk, but I feel overwhelmed by chaos in the rest of my tiny flat right now. I’m currently waiting to move, and have my workspace shoved in a corner of the living room next to a Riso machine and the laundry drying rack, and a load of music stuff filling the bedroom, and it feels like I’m swamped by stuff. The new place is much, much bigger and I don’t have to have the studio/office stuff crammed into the bedroom or living room, which will certainly be a luxury. I have a lot of projects that have been on the backburner until I have more space to work on them.